Okay, it’s Sunday morning here in Australia and I was about to go out on my walk. On Sundays, I usually do my 20km walk, but my knee has been niggling me lately so I decided I would do my shorter 15km walk. It was cold here – 2 degrees C – so I put on the requisite four layers and prepared to go out. I got my iPod, because I always listen to books as I walk, and noticed that the battery was completely flat. This was odd, I thought. I’d fully charged the battery only two days earlier, and had barely used it since. How could it have gone flat? I wanted to go out straight away, and not wait to recharge the battery, so I decided I would listen to my book – John Steinbeck’s To a God Unknown – on my iPhone, via my Audible app. However, the book wasn’t on my Audible app. Why wasn’t it on the app? It was in my Audible library, it was on my iTunes, why wasn’t it appearing on my app on my iPhone? This meant I couldn’t finish the book, not on this walk. Not if I wanted to use my iPhone to access Audible. 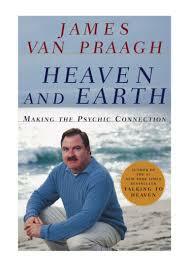 So I then began to scroll through the other books I could read – and I came to James Van Praagh’s book, Heaven & Earth – Making the Psychic Connection. James is someone I’ve interviewed for my intuition film. He gave me a wonderful interview, and we spent several hours talking in his beautiful house on the beach in Southern California. I didn’t know what the book was about, other than psychic connections, but it “called to me” so I decided that it would be the book I would read on the walk. Then I noticed that the listening time of the book was 3hrs 18mins. Usually I do my long walk, the 20km walk, in about 3hrs 15 minutes, and so this immediately told me that I should do the longer walk, that way I’d be able to listen to the book in its entirety. I began the walk, and began listening to the book, beautifully narrated by James, and suddenly realised that it was about intuition. In fact, it turned out to be about more than just intuition – but it was what I needed to hear right at that moment. In a couple of weeks I go back into the editing room on my intuition film, and tomorrow I get back into writing the script. So it was absolutely what I needed to hear – more so than the Steinbeck book. It was a far better use of my time. So through the iPod battery mysteriously going flat, and my Steinbeck book mysteriously not being on my iPhone Audible app, I was directed to a book that I needed to listen to, in order for me to progress my film on intuition. In documenting stories like this on this blog, some of you might think that I’m trying to draw spiritual certitudes out of ordinary every day occurrences. That I’m making a big deal out of nothing. And you can walk through your life and not see the signs all around you. Let me tell you – they’re there, waiting for you to see. Waiting for you to awaken. The more I go into this stuff, the more I’m given assurance that I’m on the right path. By the way, the walk turned out to be glorious. The knee gave me no pain, and I walked swiftly and effortlessly, buoyed by James’ wonderful book.